Patterns are evolving rather slowly, so little change in our outlook this week. 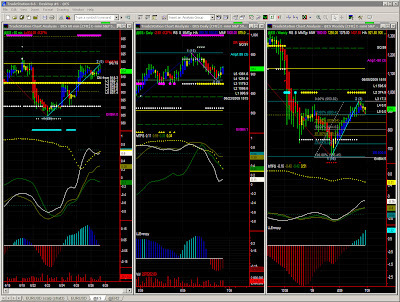 I invite you to take a look at the commented TF snapshot on our technical blog. So, our ES chart is now stalling in the high 910s, starting to feel some effects of gravity with a possible return to the pivot level (~906). The daily chart is rather undecisive and while being on a "UP" swing has little energy and should therefore remain constrained to the same trading range. Again, it is not easy to figure out which level will provide enough energy to take prices higher later on. TF follows the exact same scenario with a return to the 500-502 range first, and as ES will probably have to break this key level to exhaust the current selling pressure. 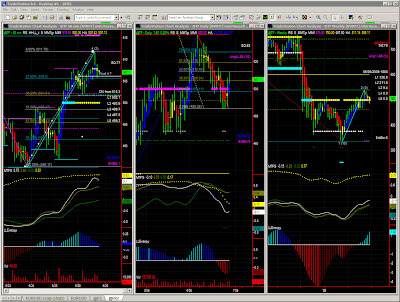 We would then see a target around 460-468 on TF and 875-884 on ES.